Excellence Hot Key is a Windows keyboard macro utility. It allows you to issue just about any series of keystrokes to your windows applications with the touch of a key. What is a macro? - A macro is a set of commands that can be run using one key press. Often commands are repetitive and tedious. A macro lets you run them all from a single combination of keys, such as Ctrl-Alt-space. 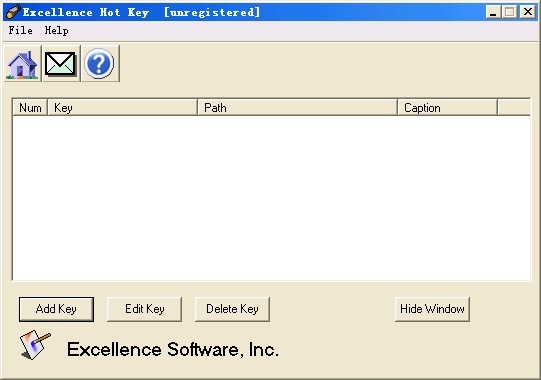 Excellence Hot Key defines an action as a typical computer-related task such as "open a web page", "open a directory", "execute a program", and others. After you create a hotkey, Excellence Hot Key hides itself in the system tray and works in the background. When you press a hotkey to run its macro Excellence Hot Key runs it while remaining invisible. I commend you hot key. Ctrl + Alt + E : E-mail Ctrl + win + W : Directory "c:\windows"
Ctrl + Alt + W : Winamp Ctrl + win + E : Website "http://www.excellencesoft.com/"
Copyright (c) 2002-2007 Excellence Software, Inc.All rights reserved.